Those adipose tissue TFAM knockout mice need a revisit. They have an engineered, adipose tissue specific, catastrophic injury to complex I. Complex I failure = insulin-independent DNL, so they should be fat. But they are thin, euglycaemic and have excellent glucose tolerance on a GTT. If complex I failure gives obesity, what is going on here? These mice were one of the core triggers to me for the concept of TCA halting due to the inability of an injured complex I to oxidise NADH. It's very clear that rotenone, at concentrations which inhibit complex I without killing your model, activates de novo lipogenesis as a technique to deal with excess NADH, excess acetyl-CoA and to provide long chain saturated fatty acids to input as FADH2 to the ETC (at ETFdh) and so to run the rest of the ETC downstream of complex I. Yet these adipocytes have mitochondria with a delta psi which is profoundly depressed. The photomicrographs show them as being completely f*cked. So enhanced insulin sensitivity is completely counterintuitive. *primary isolated adipocytes, real functional cells, supplied with 5mmol/l glucose. 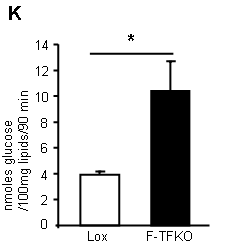 *Note, cell culture 3T3-L1 derivatives at 25mmol/l glucose. But the message appears to be that the processes to extract energy from glucose need to be up-regulated to the maximum possible. 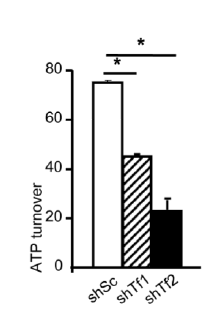 The FFAs released from their glycerol backbone do not appear to be discharged in to the systemic circulation (in these mice), they get oxidised because the adipocytes are in ATP starvation and can still use ETFdh to generate some ATP. We have considered FFAs and uncoupling before. 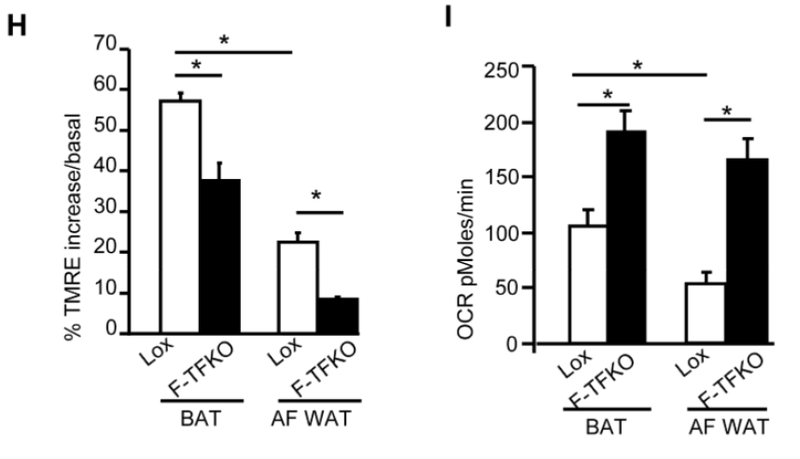 The ATP situation may not suggest uncoupling as a particularly good idea but FFAs are FFAs and, if insulin is silenced, then uncoupling seems unavoidable. BTW the control of uncoupling is so fascinating we'll have to come back to it some other time. Needless to say it integrates ADP, ATP, CoQ redox status, cytoplasm:mitochonrial ATP ratio. And free fatty acid availability, of course. 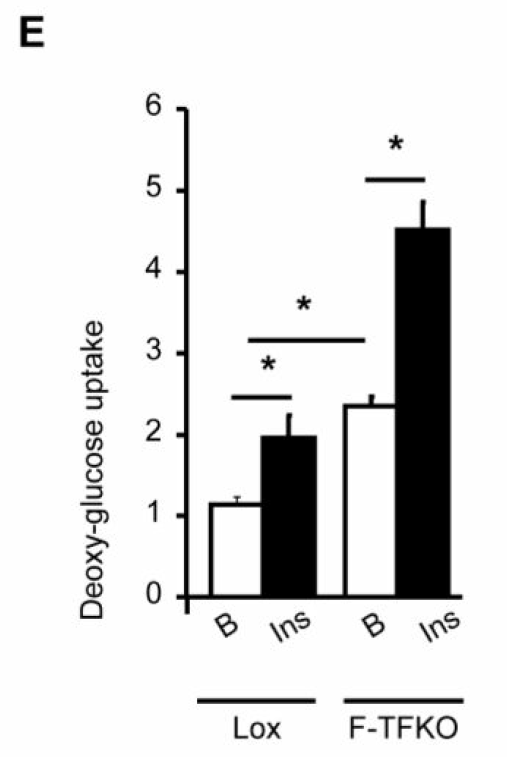 So let's summarise: Complex I damaged adipocytes are greedy for glucose without (or with) insulin. They are concurrently insulin resistant, which limits their ability to store triglycerides. Their size is immaterial. I was driven to this by a paper which demonstrated that adipocytes isolated from sucrose/lard fed mice are all equally insulin resistant, irrespective of their size (what exactly determines basal lipolysis in an interesting question, I'd guess it is not simply size, though it must be related. It's probably very important). Obviously isolated adipocytes are clear of the influence of leptin, the ventromedial hypothalamus and the sympathetic nervous system, which will certainly not be the case in any intact mouse. But, at the level of very core metabolism, this makes sense in the light of macroscopic observations. When adipocytes STOP getting fatter they do so because complex I has broken to an adequate degree. 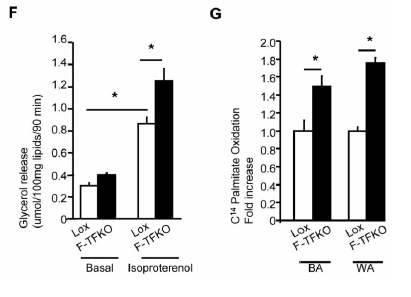 As they cease to enlarge and cease to respond to insulin they release FFAs, without any concern for higher level metabolic signalling from insulin. Systemic elevated FFAs uncouple the rest of the body's mitochondria (outside the CNS) and on we go through IGT to diabetes. This is more of a Facebook link than a blog post, but hats off to the BMJ as they have recently published some excellent articles in which neat truth appears to be very controversial (if you pedal b*ll*cks for a living). Now they have published Dr Ravnskov's response to Ebrahim's pro statin for primary prevention paper. It's a nice reply and it's great to see a medical journal giving a voice to sanity. 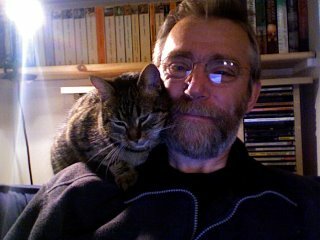 Of course, hats off to Dr R for being that voice.